Provide one point contact support no. Support Staff –Open new case support, record information and provide case ID to follow up. Product support with maintenance, ie CISCO, IBM, POLYCOM VIDEO CONFERENCE system etc. Case open will include product warranty period series no, problems etc. Help desk support staff will follow up this case for onsite support till delivery case close. Support IT Hardware and Software i.e. IBM Servers, Lenovo PCs, Lenovo Notebooks, Printers, Scanners, CISCO Switches, routers, etc..
Support staff will call system support to ensure the equipment is completely delivered and installed necessary software on time. Support staff will close the case and send the receipt to system support. Propose Telco Service, Setup Internet and Email system plus recommend subscription of ADSL, leased line, or any point-to-point leased line linkage. Provide IT documentation on schedule of events, project plan and technical drawings. Coordinate testing of all IT-related equipment to ensure they are up and running on time. Source for suitable phone-recording system. Source and recommend office automation equipment, e.g. leased/purchase Xerox, Canon copiers or multifunction systems. Provide IT maintenance support / Outsource Engineer. Provide IT consultancy services and work with all main/subcontractors to ensure job is completed within deadline. 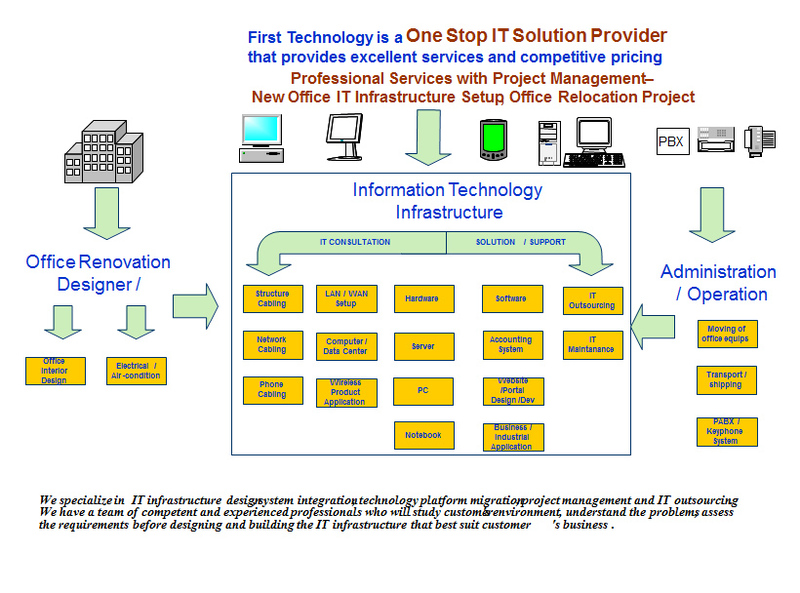 Coordinate and provide relocation or Migration Services to/from old/new office. Provide new Office design M&E work, and office furniture that blends in with total IT concept in your office. Any other requirements for your office, big or small, we’ll do it! © 2015-2019 FIrst Technology Pte Ltd.